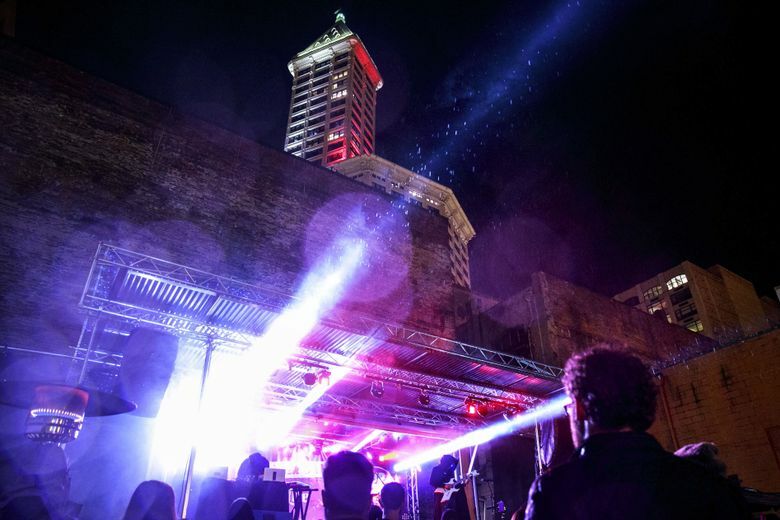 The Upstream Music Festival will return to Pioneer Square on June 1-3, 2018. Early-bird tickets go on sale Friday, Dec. 8. On paper, it looked like organizers may have been dreaming a little too big. Almost 400 bands and thousands of people converging on one of the oldest neighborhoods in Seattle for a three-day music festival? Some 390 performances and a one-day “summit” with music-industry heavyweights like Quincy Jones? All at the whim of one of the richest men in the world? Yes. And the inaugural Upstream Music Fest + Summit last May did what it set out to do: Artists from all over the region came together to talk about their craft and careers with music-industry professionals and each other, then got out there and performed at a variety of venues, all within a few city blocks. Upstream will return to Pioneer Square on June 1-3, 2018, with Meli Darby returning as lead curator, an improved app, new venues and a new, fortified partnership with the Recording Academy Pacific Northwest Chapter that — in addition to the June festival — will host year-round programs aimed at educating and launching local talent. The event will feature three days of performances, art installations and a one-day Upstream Summit of panels and talks about how artists can pursue a music-industry career. Tickets to the Summit are $25 and free to all artists performing at Upstream as well as members of the Recording Academy Pacific Northwest Chapter. Recording Academy President Kris Orlowski still can’t believe how well things went last year, considering the goals set by organizers and Paul Allen, who dreamed up and bankrolled the event. “Any festival in its first year is an epic undertaking,” Orlowski said. “I’ve never heard of one that had 390 performances on more than 25 stages. That was insane. Upstream producer Rebecca Camarda reviewed the “thousands” of “robust” survey responses from Upstream attendees, artists, summit speakers and partners to gauge how things went. “We were able to stay true to the mission,” Camarda said. She was especially proud of how Upstream’s open campus allowed for serendipitous moments between music fans and artists, and how there was music seemingly everywhere. On stages, street corners and in between. “You couldn’t get away from music,” Camarda said. “We filled a five-by-four-block neighborhood with music on every corner. I was walking through Occidental Mall and there were artists crawling all over the place. Orlowski was impressed with how members of Upstream’s host committee — representatives of AEG, the Seattle Theater Group and others — came together with the intent of helping local artists. All of the venues are participating again this year, with the addition of the ballroom of the new Embassy Suites being built in Pioneer Square. And the main stage in the North (parking) Lot of CenturyLink Field — dubbed the “Sound Lot” — will be split into two stages with alternating acts: The Amazon Main Stage and KEXP Stage. The 12 returning guest curators include Barsuk Records, Music BC, Sound Off!, MILLI, POSSI, Starbucks, Sub Pop Records, The Residency and Upper Left. More will be added in the new year. The 12 sessions at the Upstream Summit will include topics such as how to hone and share your brand as an artist; how artists can use data to make decisions about marketing; and how booking agents can find suitable talent for festivals. “Seattle is a special place, but we’re conflicted,” Orlowski said. “We have this legacy of artists here, but the tech boom has made it harder for artists to stay here.